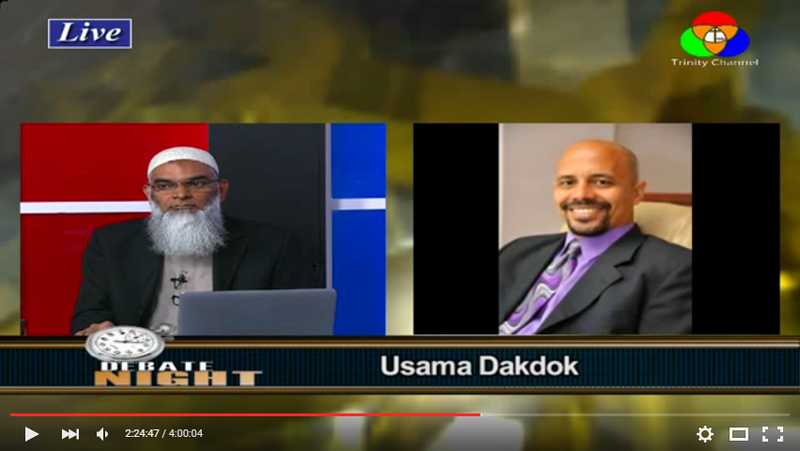 A peculiar incident occurred last night during the call-in section of the debate between Dr. Shabir Ally and David Wood. In a pre-planned call, Usama Dadok was allowed to scream and shout insults, while using obscene language in a stunt meant to provoke a response out of Dr. Shabir. Yet, Dakdok failed in his objective. The plan by Shamoun and Wood, meant to discredit Dr. Shabir by provoking him into anger did not come into fruition. Rather, the only person who behaved in a “demonic” way was Dakdok himself. Frothing at the mouth during his rabid diatribe, the insults and abuses he hurled did not cause the desired effect. Rather, the Muslims watching the debate immediately became disinterested in the discussion and whatever audience that Shamoun and Wood had intended to reach out to with the message of Christianity, quickly disappeared. Thus, as a consequence of Wood and Shamoun’s planning, in trying to use Dakdok to defame Dr. Shabir, the opposite outcome occurred. Dr. Shabir’s calm and collected demeanour demonstrated to the audience that Islamic principles and teachings, had not made Dr. Shabir a spiteful and hateful person. Rather, the incident gave the audience a reason to sincerely listen to and pay attention to Dr. Shabir’s message about Islam. Clearly then, Wood and company have demonstrated their inability to have an academic discourse without having to use childish tactics and games. The Muslim community’s perception of Wood and Shamoun have now fully been qualified, they are certainly an embarrassment to world Christianity. It is without a doubt that Wood knew he would not win a debate against Dr. Shabir and so he pandered to his audience. The type of Christians that watch the Trinity Channel, are those that enjoy seeing Muslims being demonized and brutalized. The point of the debate was not to win converts or to have a fruitful dialogue, it was to finally have their chance at getting revenge against Dr. Shabir due to the extensive work he has done in bringing Christians to Islam.